Fiction – Kindle edition; Biblioasis; 158 pages; 2014. 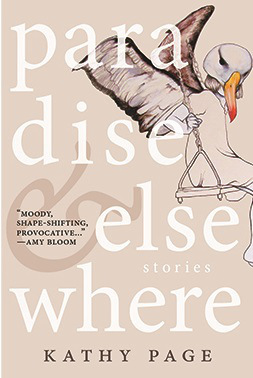 Kathy Page’s extraordinary short story collection Paradise & Elsewhere has been long listed for this year’s Giller Prize. I say “extraordinary” because it’s the best word I could come up with to describe the book in its entirety. Each of the 14 stories within it are magical little portholes into other worlds, or, as the author puts it herself (in the Acknowledgements), “explorations into the hinterland between realism and myth”. Indeed, reading many of these stories is a slightly dislocating experience. That’s because the places in which Page sets them feel real and recognisable — deserts, rural communities, suburbia, to name but a few — and yet somewhere at the mid-way point of each story, or near the end, she drops in a little detail that makes you realise these are not places you’ve ever been — or are likely to want to visit. Some are set now, others in the future after an unexplained and presumably catastrophic event has changed civilisation in subtle but oh-so important ways. There’s definitely an undercurrent of menace in many of these tales. People are never to be taken on face value, never to be trusted, because underneath they’ve all got their own private, self-interested agendas. Many characters are manipulative, dark and dangerous. Others are weak and naive — and are always taken advantage of. This all adds up to some pretty edgy and deeply disturbing short stories, I must say, but Page reigns it in beautifully. There’s no pyrotechnics or melodrama, although the climax of each story is often surprising or unexpected. The writing is restrained throughout; there’s almost a journalistic quality to it and I was often reminded of the very best kind of travel reportage that not only transports you to foreign climes but describes the culture, the food, the people and tries to put it into context. Some tales also read as fables — not dull, overly simplistic, fables, but ones with dark moral messages at the core reminiscent of British writer Magnus Mills. I said that she must be taught our language. Then she could decide whether she would stay or not, and if so she would have to be told our methods of cultivation and given a home and responsibilities. Others agreed that she should learn how to speak to us, but only so that we could find out where she had come from and send her back to it; there were limits to hospitality. However well-taught and well-loved she was, these people said, she would always feel slightly apart from us who had always been here. The community becomes increasingly afraid of the stranger in their midst and want to cast her out, not least because they feel she is a burden they can no longer support. The traveller, I pointed out, might well be a gift as much as a responsibility. She might have some skill we did not practise, she might have reached some understanding we were still groping for. Perhaps we should accept the unfamiliar and learn from it? I won’t elaborate on what happens to the “foreigner” — you’ll have to read the story yourself to find out — but I couldn’t help thinking of all the issues associated with immigration (both legal and illegal) and border controls that fill our newspapers and TV screens on a daily basis. And perhaps that’s the greatest strength of Paradise & Elsewhere: Page takes seemingly familiar issues, places and people but alters them ever so slightly so that they’re recognisable without being completely “other”. As a whole, the book is a wonderful exploration of an old topic — what it is to be an outsider — but it is done in such an original and refreshing way I couldn’t help but be impressed by it. I can be a bit so-so about short story collections, but I loved this one, not least because each tale gave me something to mull over and “chew”. For that reason it’s not one to race through, but one to saviour and enjoy. Finally, I can’t finish this review without pointing out that I read the Kindle edition of this book and was rather annoyed to find the table of contents located at the rear . I didn’t even know it was there until I got to the end of the book, by which time I had no need to use the table. This might be something to bear in mind if you purchase the Kindle edition. Nice to read your enthusiastic review of this one, Kim, because it makes me reconsider my own less enthusiastic response to the book. I read this collection a couple of months ago and was actually glad to finish it and move on to something else – I couldn’t fault the writing and the stories are often thoughtful and different, but a lot of them fall into the “adult fairy tale/fable” camp which is really not my cup of tea, and something I usually avoid. So whilst I appreciated the skill, I didn’t enjoy the book all that much. Though flicking back through my copy now I see that a couple of the stories have left an impression – ‘We, The Trees’ especially, but also the one about the TV crew’s visit to the English town that nobody leaves (it’s a dystopia but I think I’ve been to a couple of places like that!). I personally hate fairy tales, especially if they are geared towards an adult audience, but I did not think any of these stories felt fairy tale-ish. Yes, they resembled myths and fables (in places), but on the whole they read like “normal” (for want of a better word) stories… but there was always something about them — a certain mood, a certain detail — that made me realise they were not rooted in the real world but in a kind of mirror world (if that makes sense) and for that reason they resonated. I also wonder if these stories might better appeal to people who travel a lot or have immigrated, because Page really captures that sense of difference and dislocation one feels when you are a foreigner.